Sunflowers just bring smiles to our faces so they are the perfect subject for watercolor painting! What could be happier than a sunflower? In my garden I always get volunteer sunflowers because I feed the birds sunflower seeds during the winter. I live in a clearing surrounded by woods so there are just small areas of sunlight and I make the most of all of them. This sunflower is in one of my tomato beds. We built raised beds for the vegetable garden (9 in all!) this summer. Everything is producing like crazy and we are eating most meals from the garden. I love raised beds! 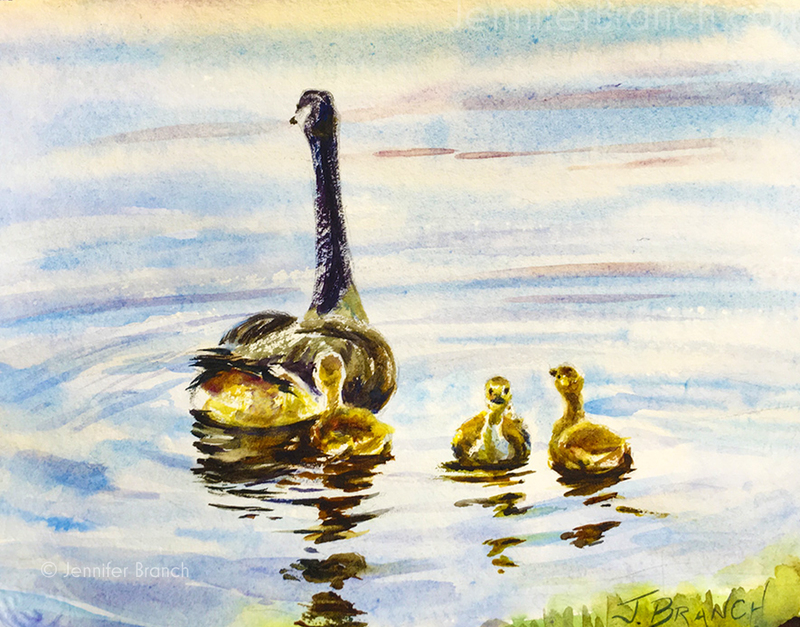 I was going to sketch this painting for you on location, but it's over 95 degrees Fahrenheit (35 Celsius) outside. I'm afraid that point marks my summer hibernation into air conditioning for the year. It's funny but in colder areas, you don't go outside much during the winter. Here, midsummer is melting hot, but January is not too bad! I painted this sunflower several times, sketching it to work things out. When I painted the woods with the deep rich darks that you can see in the photo, the sunflower looked stilted and pasted into the painting. By lightening the background I ended up with the loose effect I wanted. I always begin a painting with a loose wash all over the painting. I could see hints of blue sky through the trees. Since blue is a perfect foil for a yellow sunflower, I started with cobalt teal, cobalt blue and pthalo green (mixed with azo yellow). In a beginning wash like this, let your brush dance! Leave lots of whites and don't hit areas with paint more than twice. I continue this wash by dashing around more paint. Since I want the sunflower to move in and out of the background I add some yellow around the petals. I love painting sunflower buds. They're so much like artichokes (same family)! Very structural, interesting shapes. 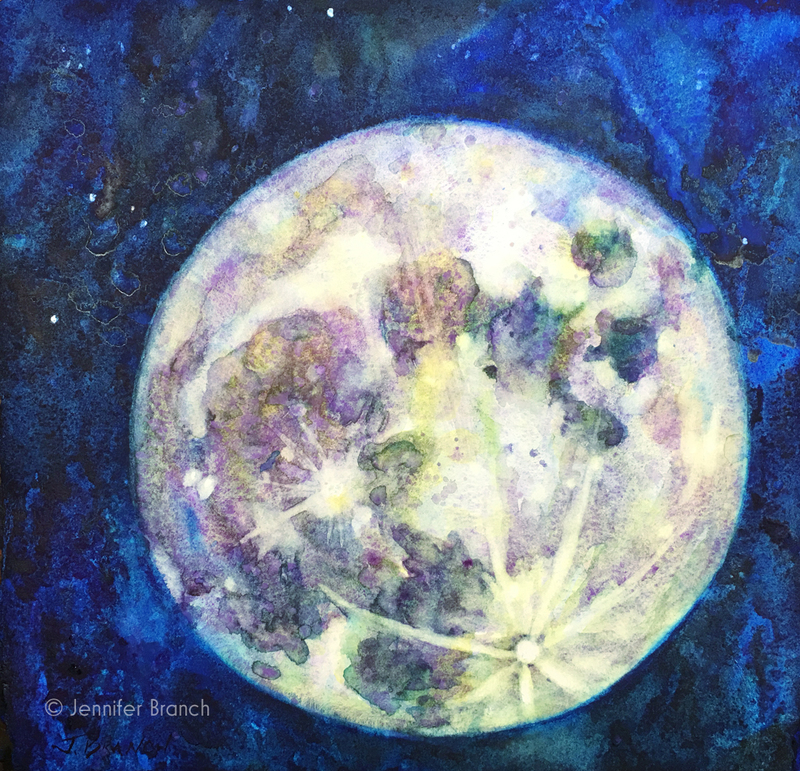 I'm still working on the same wash, moving around the painting. I add a bit of quin gold to start working in the shadows. Remember you need lots of whites for the bright sunlight effect. 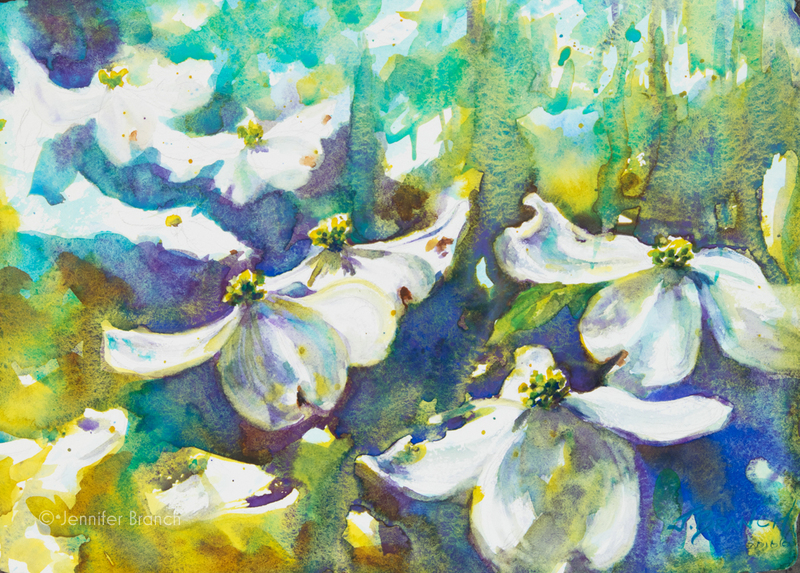 When painting a light yellow flower against a dark blue background, take time for the washes to dry. Otherwise you'll be painting a green flower! Still in the same wash, I add some rich ultramarine blue to pop out the highlights. Now it's time to let it dry completely! Now that the painting has dried I can add a few layers to give the background depth. I start adding some bright orange yellows with cadmium yellow and cadmium red. I don't want too much of the chalky opaqueness of cadmium but a little brightens up the painting. Now I'm painting the petals, just letting the watercolor bleed together with the oranges and yellows. I want to leave lots of highlights still for the bright sunlight on the stamens. A little bit of detail goes a long way in a loose painting. Be careful not to overdo the detail! A few more details and the painting will be finished! I add some shadows to the flower buds and the sunflower, rounding the shapes. Some darks to bring out a few areas brighten the sunflower petals and leaves. To purchase Sunflower original watercolor painting, please click! 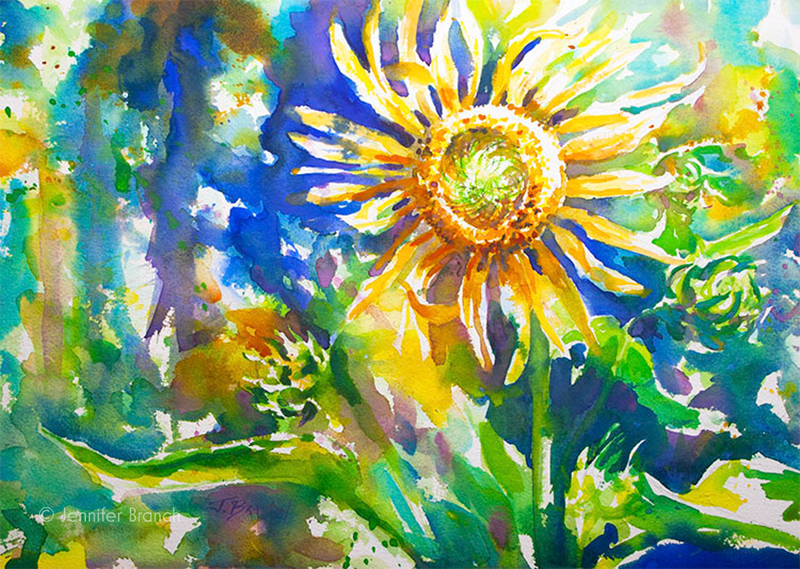 This sunflower watercolor painting is bright and happy, just like the flower! Keeping the contrast dancing around the painting rather than just at the center of interest made the flower full of movement. 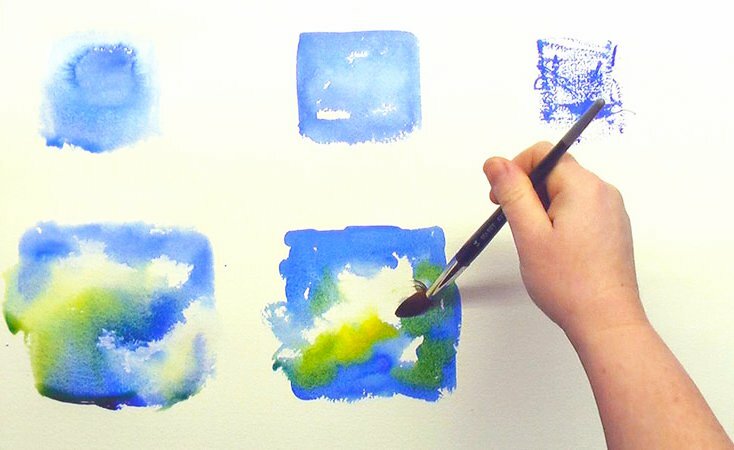 I hope this tutorial inspires you to go paint in your own garden or nearby park. Don't feel bad about doing sketches and doing the serious painting inside if conditions aren't comfortable for painting outside. The important part of plein air is to really notice the world around you but if all you're noticing is that it's hot as blazes outside, you're not going to do your best painting! Be happy, go paint a sunflower!